On the picture you can see the key ring spring attachment that was produced for three months in 1999. The one in the middle is an advertising knife and it got the new tang stamp from 2004. This should suggest that one need to be careful to date a knife into 1999 just by the spring attacment. Both got the notch. 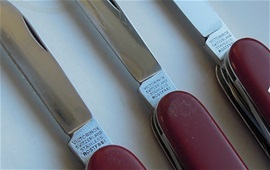 The left knife is a standard range Victorinox line and middle knife is an advertising line. The two pictures show three knives 84mm and 91mm with the stamp from late 50s until 1974. The three knives on the picture is late 60s(1966) until 1970. There are a few differences in the stamp itself but the message is the same. The backside on the same three knives. 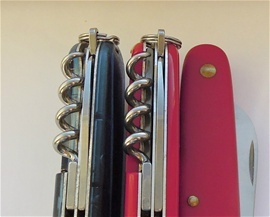 The extra loop corkscrew on the knives from 1966-1970, the same knives from above. This is usually not to see after 1973. The grooves or decoration contiuned after this. The bail on the 91mm is interesting. This was officially replaced with a key ring attachment in 1968. The new can opener from 1951 on the Officiers knives is used today on all the categories. The Alox 93mm knives got this from 1957, from my information is seems the +Pat is usually not seen on most categories from Victorinox after 1971 +-. On the picture today there is some information about the corkscrew. This is most likely a late 1990s knife. I have discussed some before on the variations with the corkscrew. Between every evolution change done by Victorinox you will find small variations in the design or shape. This is on an 84mm advertising knife. There must be at least 10 different ones outside the regular evolution made, if not more. 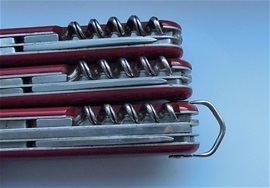 This can be a simple thing as shown on the picture with the front section of the corkscrew having a larger opening compared to the end of the looped shape. There are different reasons for all these variations. The tang stamps on the main blade are interesting for different reasons. 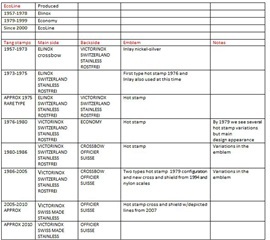 As you know Victorinox use and used many independent markings on a number of categories. Some are for more than one category. 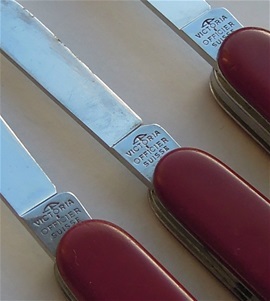 It is the same with the stamps as a number of other Victorinox functions with variations between each evolution marking or stamp. It may look the same at first eye. With a magnifier you will see that it is impossible for them to be made by the same module and may contain hard to see design changes. Back to the corkscrew the modifications can be for a number of reasons and they are best to notice with the mini screwdriver. The main evolution on the Officiers knives are a bit different compared to the 84mm category. Advertising and economy made knives are also different. I will not let go of the angle differences just yet because there are similar designs with an opening that is a bit bigger. It is not so that hard use forced it in this fashion. The one on the picture is just a bit too much different so it is a variation in itself to me. It is just one of the types that you may see or find with Victorinox SAKs. It is absolutely not a problem of any kind. victorinox army knife keychain in box, it has a ram on top of a rectangle plus cross . i cannot find anywhere this symbol can you tell me date of it?